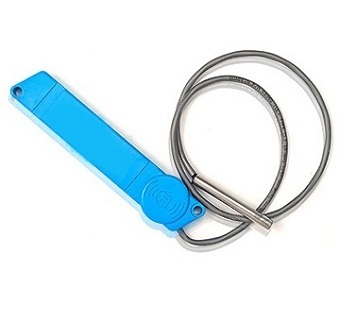 IP67 UHF RFID-Double Sensor Data Logger with up to 2*4096 data sets for temperature logging. This product family is the ideal portfolio of RFID enabled loggers for temperature-sensitive products that may be damaged when exposed to improper temperature ranges during shipment and storage. Especially indicated for food and pharmaceuticals, the RFID loggers are well suited also for chemicals and special industrial products. The AGX TS01 enables a new era of Cold Chain Management Solutions. Track & Trace solutions based on EPCGlobal UHF RFID standards can be combined with environmental monitoring and shelf life prediction capabilities. tags can be read and configured using a standard EPCGlobal compliant RFID reader without the needs of special commands or devices. Pharmaceutical and food industry can use this data to calculate when to replenish perishables and how much product to put on shelves. The benefits of applying RFID and sensors to perishable goods include improved food and drugs safety, longer vaccines and drug efficacy, more efficient product recalls, reduced costs due to less spoilage, lower inventories, more efficient logistics and improved customer service. products allow both passive and active risk management for continuous improvement of the quality process. The product can be easily checked at any time in order to accept/reject the shipment, the analysis of the temperature vs. time data allows active riskmanagement: the critical points of the cold chain can be identified and countermeasures can be put in place to avoid further failures (continuous improvement).